MG-20 is the floor guitar processor with 32bit float point DSP equipped and True Simulation of Analog Circuits (TSAC) technology. 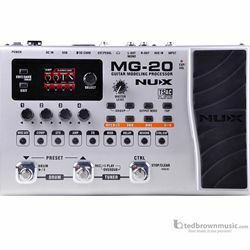 Up to 60 models, 60's looper, sample-based drum machine and MP3/WAV player, sophisticated user interface and big colorful LCD display, MG-20 is the pro solution for guitarist who wants to nice tone and function. The multi-purpose CTL pedal allows you to switch effects on and off, boost volume for solo, TAP the delay time and modulation speed, or play/stop backing track! With an extensional pedal and the built in Expression pedal, you are going to have superb control on stage! Lots of possibilities! With the USB port, you are able to update the system and edit tone on your computer! USB Port for Updating Software and tone editing.